I am often asked exactly what the definition of a play-based, child-led program is. There are so many ways to answer this question, but I feel the best, most thorough way is to describe the role of the adults, and the role of the children in a play-based, child-led program. Keep in mind that the following roles are from "The World According to Denita". These are things that I have learned to be true in my own program as I have transitioned over the last 6 years from a teacher-controlled/led program to one that is play-based and child-led. Clear boundaries, clear expectations and clear consequences provide all the structure a young child needs to be able to learn respect, practice self regulation and thrive. If you are finding that you are still, even after setting up the structure, saying no....then it is time to check in with your expectations, and make adjustments accordingly. I have learned through the years that when "no" is the only word I can use, and I am using it a lot. The problem is not the children, the problem is my expectations. I need to reset the structure. 2) Provide a rich environment. Provide an environment rich with open-ended opportunities. If you are trying to transition from a teacher-led/controlled program to a play-based, child-led one….you CAN still put your theme stuff out! The key is OPEN ENDED. This time of the year, you may want to put pumpkins or apples, or leaves in the environment. In a child-led, play-based program this is fine as long as you truly follow where the children take those objects. Plop (noun): Anything that is placed in a child’s environment with zero adult direction, demonstration or expectation. The child is given the freedom of time, technique, task and team. The adult quietly observes and gives opportunities for children to try, fail, succeed, explore and ask for what they need. The adult in a child-led, play-based program needs to give ownership to the children as much as possible. SHOWING HOW takes away ownership. Unless there are safety concerns, it is incredibly valuable for the adult to be able to quietly observe as children figure out how to use the bright new shiny objects that may be in their environment. Give ownership of discovery to children. The plop was these simple floor tiles. The children were given freedom of task, technique, team and time. Over the course of a week, this awesome "Candy Land" game emerged from the minds of my littles. It is SO important to understand that I had NOTHING to do with this. My role in this bit of brilliance was plopper, observer, stage hand (I got out the giant dice upon request) and documenter. The adult must trust the children to lead their own learning. When a child feels they are trusted, they are empowered. Empowered children confidently share their thoughts and ideas, try new things express their wonders. The adult must also trust the children to assess risk. Without risk in early childhood programs, how will a child learn how to manage it? I'm not talking about handing 12 children Ginsu knives. I'm talking about climbing up slides, roasting marshmallows, using real tools like hammers and screwdrivers, walking with scissors (gasp!) and standing on a chair to solve a problem. My littles are well aware of the word "cautious" and "careful". They know how to be both. They are very empowered when I let them do something that involves a bit of risk. Here we see Trillian solving a problem. He had a plan. He observed again, and again, the older children solving this very problem: turning on the fort light. He took what he learned, and is trying it himself. He is learning to be careful, I am closely observing. The children in my program know they may stand on a chair to solve a problem, but they must be ready to tell me their plan. 5) Control the environment, NOT the children. When thought is put into the environment, and expectations meet the capabilities of the environment, children can then be in control of their learning. Got messy? How are the children going to clean themselves? Control the environment so children can be successful. Clean up should be near the messy space when at all possible. Think through the activity and set up the environment with success in mind. With that said...make sure you don't get rid of all the conflict when controlling the environment. I made that mistake for years. I was in the "preventative management" mode. I have learned that children NEED conflict in their days in order to learn how to handle it. We are doing young children no favors by controlling the environment in a way that gets rid of all conflict. Notice how the handwashing bucket (the purple one) is placed in a handy position between the two bucket of clay play? The environment is controlled. The structure is also there. My littles know that they may not, under any circumstances go into the street. They know they may drive their cars to both of my neighbors homes and back. Those are the CLEAR boundaries that provide the structure a child needs. All of this works cohesively to now be able to let the children be in control of the play. Resist the urge to come to the rescue of a child who is struggling to solve a problem or accomplish a task. Respect the child and give them the opportunity to ask for what they need (perhaps different materials, a tool or help). The adult must bite their tongue and recognize the valuable learning found in working through a problem for oneself. Ownership of failing is filled with valuable opportunities to learn about persistence, determination and success. Parker's feet are stuck in a pile of goop. Ty is trying to lift him out. It is clearly not working. Instead of stepping in, I respected Ty, and waited patiently for him to try other techniques, or to eventually ask for help. This is what happened that sparked Ty wanting to return the favor to Parker!! Ty got stuck in the goop, when Parker tried to rescue him....the entire container lifted too!! It was HILARIOUS!! The often overlooked skills of solving problems, managing conflict, self regulation, self-help skills, cooperation, collaboration, consideration, patience, taking turns, asking for what we need, imagining, expressing oneself with words, persistence and determination are truly the most important skills for young children to have the opportunity to practice and polish. I got this child a bag and told her she had a problem that she needed to solve. She caused a mess in my yard that needed to be picked up, and she ruined one of our balls. Once the pieces were picked up, inside she went to put the ball back together. I asked her if there were any tools she felt she might need. "I am going to need some glue." I then left her to accomplish the task at hand. She worked tirelessly for FORTY-FIVE minutes to repair the ball with zero success. At last, she announced (in her best, "sorry, the patient didn't make it" style): "Tenita, I can't fix it. I tried, but it is really hard. I am sorry." 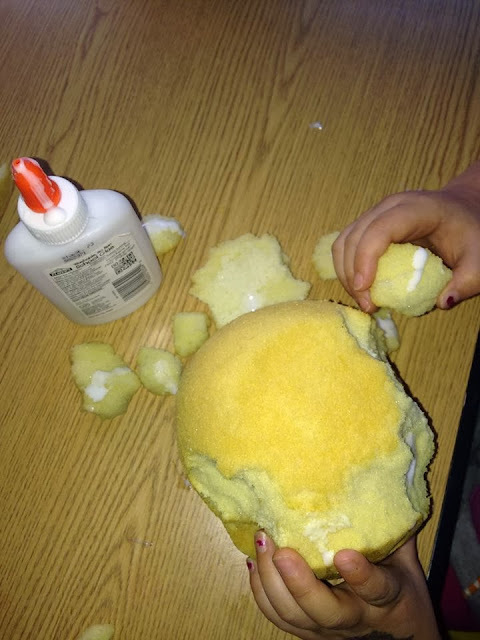 There were tears as she announced to the rest of the crew that she was unable to repair the ball (everyone kicked in with perfect dramatics at the loss of this 8year old, seen it's better days, ball...they did GREAT!). The point of this long story? Look at the life-long skills that this child learned from the experience: problem solving, ownership of bad choices, failing, responsibility, cause and effect, trial and error, expressing with words, owning our actions, respect and independent thinking. 8) Educate themselves of how skills build on each other. The adult in a play-based, child-led program must be able to see how skills build upon each other. They need to be able to dissect play to reveal what is truly going on. A young child buildling a block tower is not only working on small motor skills that are necessary for handwriting, they are also polishing their perseverance and determination, they are learning about trial and error and cause and effect. Connections are being made that will help the child make sense of this world. Thinking through problems and finding a solution as well as measurement are also found in tower building. As the child progresses, imagination, counting, comparing and contrasting and vocabulary will soon be added to the tower building process. Whether pulling oneself UP the slide, pulling a wagon, or a bag full of pumpkins, using the large muscles of the upper back and arms are preparing us for writing. The body developes from the inside out. LARGE muscles need to be strong and coordinated before we can control the small motor muscles of the hand. Handwriting does not begin by placing a crayon in a child's hand. It begins with crawling and using the BIG muscles. 9) Be prepared for “I wonder if…” moments. In an environment that is rich with open-ended opportunities, children WILL wonder. They will ask for more materials, they will want to try new things. Adults must be prepared and be willing to get the additional supplies needed in order for the child to own the discovery their “wonder if..” will lead to. Gavin wondered if the dragon will float down the raingutter just like the water snake he made does. Trial upon trial, failure after failure told him that no, the dragon does not float. 10) Observe and document the learning going on around you, not because of you. Observation and documentation is the best way to truly see the value of a play-based, child-led program. Document with words, pictures and videos. Write down every single "aha" moment that occurs. I know some early childhood educators that were able to get an "Unexpected Learning" column added to the lesson plan form that is a requirement in their programs. Whatever works for you, DOCUMENT. It will not take long for you to realize the truly authentic and meaningful learning takes place during those "adult-out" child-led moments. This is a great example of the learning that can occur AROUND the adult in a play-based, child-led program. Yes, I set out the bubbles, yes, I set out the squirt bottles (see "Provide a Rich Environment") I did NOT have any intentions of these two items merging. Not only are these boys empowered by THEIR awesome idea...but there is also valuable visual tracking, visual planning, eye-hand coordination, small motor strengthening and imaginative story lines being invented and shared! Whether in person or through technology, take every opportunity to educate others of the value and importance of play. Visual tracking is a skill that holds great importance when it comes to reading and math. It's value needs to be expressed to parents and they need to be encouraged to stop letting their children play with their smartphones and ipads. Eyes need to track objects in a LARGE plane (like across the room, in the air outdoors).... a smart phone screen and ipad screen is NOT a large plane. Children in a play-based, child-led program should have confidence in their right to lead their own learning. They should be aware that the adults trust them and therefore feel free to explore their world freely, making and owning discoveries. Children are in control of very few things in their life. While in the open-ended envrionment of a play- based, child-led program a child should feel a sense of control. If the adult has faithfully done all that is listed above for the “Roles of an Adult”, a child should be empowered with the gift of control. Children can feel in-control through ownership of their “I wonder…”s, discoveries, failures and successes OR…they can feel a sense of control through negative behaviors like knocking down a friend’s creation, taking toys away or pushing down a friend. Either way, a child craves control. Which way would you rather they cure that craving? Children who are empowered through the gift of control can solve problems because they are confident. Empowered children aren’t afraid to use their imaginations, to try, to fail, to be determined or to ask for what they need. All of which are components of solving problems. Since the adult is aware of the value of struggling, a child's right to solve problems for themselves and to determine at what point they may need help is honored. 4) Has freedom of time. The freedom a flexible schedule allows gives children the opportunity to accomplish deep, thoughtful play. Time gives children the chance to think through solving a problem, it allows them time to try different ways and figure out which one is the best. Time gives children the opportunity to role play and practice what they know, all through play. Time gives children the chance to test different theories, try new ideas and merge several story lines into one. Time gives children the ability to work through social conflicts like taking turns, collaborating ideas and teamwork. Time gives children opportunities for authentic, meaningful learning. This photo is from "The Box Experiment of 2010". I removed almost all of the toys (with the exception of dress up clothes, the play kitchen, cars, balls and books) and filled the environment with the ultimate in open-ended wonder: cardboard boxes. This was half way into my transition from teacher-led/controlled to child-led/play-based and I didn't not realize the benefit of time then. Looking back at this picture I realize how many techniques were developed because the children had TIME to freely explore, build, try and fail with the boxes. 5) Has freedom of task. 6) Has freedom of technique. If the adults in a child-led, play-based program can successfully bite their tongue (arguably, the hardest part of all of this!) the child can then have freedom of technique. Children will go about things differently then adults. There are many ways to accomplish a task or solve a problem. Let children fail, let them succeed, let them try – give them the freedom of technique. There is so much more learning involved in failing then there is in an adult stopping a child and telling them what they are doing will not work. While my adult mind was wondering why on earth you would use this technique to poor water from one container to another, my ability to bite my tongue and give children the freedom of technique won out. I did not say anything, and this grand technique has been used for over a year in all sorts of situations. The child I allowed to own this discovery and this technique is EMPOWERED. 6) Has freedom of team. Let children choose their team. That team may be no one at all. That is fine. Respect a child’s choice to play by themselves, or to play with a friend that always ends in fight. The learning in that situation is priceless. On a related topic, a child should not have to share just because another child would like to play with them. Respect a child’s right to play alone and trust that they will take turns with the other child when they are finished. As I am re-reading what I wrote and editing (I have SEVERE editing issues) to make it all pretty and snazzy for you all (ha), I am realizing these lists could both be larger. Please take what I have learned through my experiences and compare it to your own list and add to it! I truly believe that having the roles of the adult and child clearly defined is the best way to express, in words, what "Play-based" means. If you get nothing else from this post, I hope that it cements even further the fact that play IS the "important stuff"! The problem: Trillian walked too far with the pulley bucket....and now, the "pull" side is waaaaay up high, stuck. Trillian is the one who caused the problem (aha! Cause and effect), so he is the one with the responsibility to solve it. He immediately gathered the tools he needed: a chair and the grabbers. He then told me his plan. One of the CLEAR EXPECTATIONS that forms the structure of my program is that my littles must tell me their plan if they are going to be standing on a chair, or using a tool to solve a problem. Having the clear expectation of needing a plan gives children a chance to explore logical thinking. It gives them a chance to have foresight and to put their actions into words. It offers a time for independent thinking and builds one confidence in sharing their thoughts. Look at that focus. Trillian is motivated because this is his problem, it is his plan. He is also learning how to coordinate his body. Let's face it. Failing is a fact of life. Why are we so afraid to let children fail...to let them struggle? Having time to practice these things in a loving environment gives him the tools to handle such situations when struggles cross their path. Moments like this also offer practice in self-regulation. I know many littles (and adults too) who will break down into a tantrum whenever they are faced with a challenge. BUT, once they experience the success that can come from perseverance they will begin to strengthen their ability to control themselves and learn to try. Giving children opportunities to fail and struggle also gives them opportunities to ask for what they need, and that includes asking for help. I know adults who do not know how to ask for help. Admittedly, I struggle with conceding that I need help. Setting up the structure of your environment in such a way that children know the CLEAR EXPECTATION that they must try before asking for help, lets them know you believe in them, that YES THEY CAN accomplish difficult tasks. After SEVERAL tries, Trillian finally accepted the fact that he was not going to be able to solve this problem on his own. He needed help. He swallowed his pride, and asked his buddy, Caleb for help. Why did he chose his buddy Caleb? Because he was taller then him. Trillian predicted that since Caleb was taller, he would be successful. Giving children opportunities to solve problems, also gives them the opportunity to be compassionate and helpful. It feels good to know you helped someone. Caleb was SO close....he was trying so hard he was actually getting hot! It was very hard for him to finally admit that he wasn't going to be successful either, and so he too, swallowed his pride, and asked for help. The third and final (sorry if I ruined the suspense for you :) ) helper was Jack. Jack was the chosen one because he was OLDER then Caleb. The thought process that occurred during this problem solving session was simply amazing. The children had gathered their thinking hats, used their smarts and deducted that AGE must matter when it comes to reaching very high. Jack hopped up on the chair and was successful in a matter of a few short minutes. He was seasoned at balancing on the chair, and controlling the grabbers. He knew how to recognize danger and how to use caution (as you may have noticed all of my littles in this scenario did). The important thing to notice in the following picture is Trillian in the bottom right corner. He still owns this problem. He also owns the process of solving it. It was, after all, he who caused the problem, he chose the technique to use to fix it, he gathered the tools needed, he devised the plan and shared it with me, he tried as if his life depended on it and he was the first to concede and ask for what he needed: help. Word quickly spreads in my program that there is a problem being solved. See Lindsey and Evie? They are ready to assist if needed. I love the compassion and kindness of my crew. I also love their ability to collaborate and work as a team. This was truly a team effort. I dare say there isn't a curriculum in this world that can provide a moment like this that is so rich with learning in the time span of 5 minutes. AUTHENTIC learning, that is overflowing with meaning will STICK, it will be recalled again and again, it is the way young children were wired to learn. I challenge you to step back. Resist the urge to come to the rescue. Give children the feeling of trust, the time, the opportunity to practice self control and the empowerment that comes with solving a problem. Let the children solve problems, let them be the curriculum. Play IS the "important stuff", it COUNTS!! !